I dunno what im doing actually. Without a proper internet, 1 day write 1 post. Im still wondering why u r reading…. A meaningless post a day, keep your readers/traffic away! So better dont let this continue. Download speed damn slow, plus place i stay the internet cannot be fixed! Damn! Follow my twitter and i will spam twitter Gao Gao when im too free and boring! Haiz… this is the 3rd day without a “proper” internet. APIIT is so well known for its computing and IT section, and its in technology park summo, but the internet service provided is…..
Their school WiFi is slowwwwww like turtle. EH< got error summo >.< this is the earlier try. Wah So Fast download leh! Proud of APIIT! Haiz… so sad. Not only i miss my download life, i can hardly enjoy my surfing net life too…. Loading Google Reader itself take a few minutes… Used to get it done in seconds…. 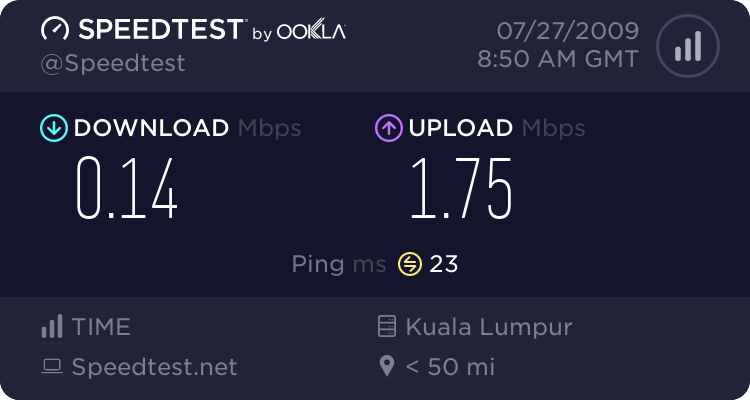 Guess had to depends on Wireless@KL which is slightly better. But capped at 500mb transfer per month. I used to remote my computer few times enough to used up those 500mb. Sad lah! Wait and wait and wait and wait. Life with no internet… Luckily i bring all my “downloaded collection” like my anime collection! So do hope internet (at my room) can be repaired and ready to use asap.